President Obama told a group of young Africans today that they should strive to "update and create new traditions," particularly when it comes to the role of women in society. "If you look comparatively at countries around the world, what societies succeed, which ones don't, one of the single best measures of whether a country succeeds or not is how it treats its women," the president said. Using the analogy of a soccer game in the wake of the recent World Cup, he said if a team were only to go out with half of its team, "you will not do as well." The president's remarks came in response to a question about the U.S. commitment to ending gender inequality in Africa. He was speaking at a town hall for 500 Africans visiting Washington as part of the Young African Leaders Initiative (YALI). "As a continent you have to update, and create new traditions and that's where young people come in. You don't have to accept what was the old way of doing things. You can respect the past and respect traditions while recognizing they have to be adapted to a new age," the president said. He cited women's education as "an absolute priority" for the U.S. because women will spread their education to their children and their villages. But while he encouraged the young leaders to be respectful of tradition, he said it's also time for some customs to go. "There are some traditions that just have to be gotten rid of and there's no excuse for them. Female genital mutilation, I'm sorry, I don't consider that a tradition worth hanging onto," the president said to applause. Aimed at training the next generation of African leaders, the program's inaugural trip to the D.C. area included a visit to Thomas Jefferson's Monticello Plantation. "I really appreciate these courses because it's going to give you tools to explain your vision to people," Martine Ekomo, one fellow studying in the Presidential Precinct, told CBS News' Jillian Hughes. YALI, which was created in 2010, is being renamed for the late former South African President Nelson Mandela. The program will be expanded by 2016 to bring 1,000 participants to the U.S. for leadership training at some of the top U.S. universities. The six-week courses focus on business and entrepreneurship, civic engagement, and public administration. "Even as we acknowledge the real hardships that so many Africans face every day we have to make sure that we're seizing the extraordinary potential of today's Africa," the president said. At the end of an hour-long Q&A session, the president told the assembled group not to be discouraged when they face obstacles upon returning home. "Progress sometimes can be slow and it can be frustrating, and sometimes you take two steps forward then you take one step back," he said. "But the great thing about being young is that you are not bound by the past and you can shape the future. And if all of you work hard and work together and remain confident in your possibilities and aren't deterred when you suffer a setback, but you get back up and you dust yourself off and you go back at it I have no doubt that you're going to leave behind for the next generation and the generation after that an Africa that is strong and vibrant and prosperous and is ascendant on the world stage." 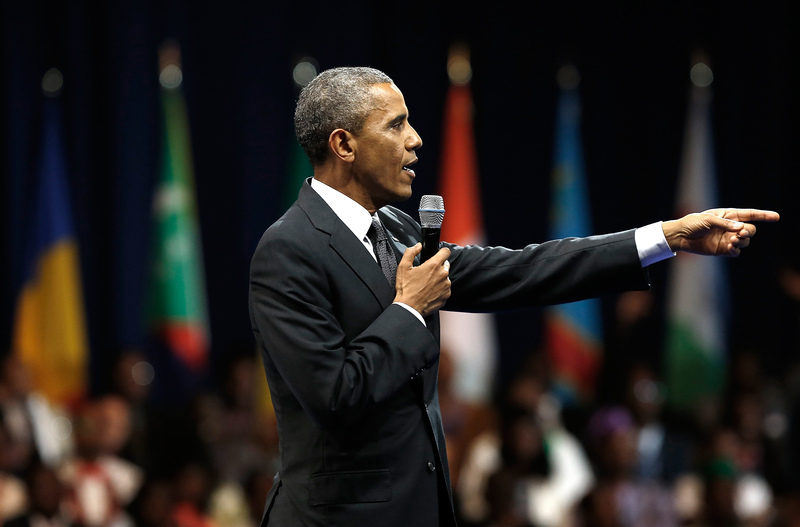 Mr. Obama announced the creation of four Regional Leadership Centers in Ghana, Kenya, Senegal and South Africa. Through a public-private partnership they will offer long and short courses in leadership, support entrepreneurs and create networking opportunities between the young leaders, American professionals and regional experts. It is funded with $38 million from the United States Agency for International Development (USAID), along with capital from companies that include The MasterCard Foundation, Microsoft, the Dow Chemical Company, Intel Corporation and Cisco Systems. Over the next three years, the U.S. Africa Development Foundation (USADF) will also provide $2.5 million seed funding for 250 social entrepreneurship grants to members of the YALI network. The money will go to projects in Ghana, the Democratic Republic of the Congo, South Africa, Zimbabwe, Tanzania, and Rwanda. During a speech to the group Monday morning, Secretary of State John Kerry praised the work of several young people in the audience but also offered a frank assessment of the challenges they will face when they return home. "The choices that African leaders make, the choices that you make, the choices that you push the political systems of your country to make, the choices you help to debate and put on the table and make part of the dialogue of your countries, all of that will determine the future," Kerry said. "You will decide whether a decade of progress leads to an era of African prosperity and stability or whether your countries tragically fall back into cycle after cycle of tragic violence and mark a governance that is weak and stifles the promise of a continent for too long." Next week, the president will welcome African leaders to Washington for the inaugural U.S.-Africa Leaders Summit. The White House says it will be the largest meeting a U.S. president has held with African heads of state and government, about 50 of whom are expected.